All houses have a fully equipped kitchen , electric heaters in bedrooms , woodburner stove in the living room of Villa Orchidee & Villa HIbiscus. During certain periods, we offer reduced rates when you rent 2 or 3 houses if your group size is less than 19.Visit our website for more photos and information about our propery and the individual houses . *Villa Orchidee is a Large house with 5 Ensuite bedrooms that sleeps 15 people. The houses can be rented individually or together to accommodate large groups ,ideal GROUP ACCOMMODATION for MULTI-GENERATION FAMILY GATHERINGS OR several friends wanting to share a holiday together in one location in separate houses. **Great Location- secluded and peaceful ,yet a mere 5 minute drive to amenitieis ,30min to sites y. The world famous prehistoric caves of lascaux are 5 minutes drive. You can walk to the village for fresh baked croissants & baguettes .There is also a bar & restaurant offering 4 course meals for 12 euros! Available all year, all rooms have electric heaters for the cooler months. Villa Orchidee & Villa Hibiscus also have a woodburner stove. We came to Montignac with our 2 children on a family holiday in 2001. The kids loved the area-there was so much to see and do and always there was something new to experience and discover. We did this for 7 years , then we found Le Four a Sel fell in love with it and decided to make it our home We love the peaceful rural setting,the wonderful sense of freedom this large expanse of space our property gives us and being beside the river is just so relaxing . And we are still in awe of the stunning scenery of this part of the Dordogne.We still get pleasantly surprised when we drive around and stumble upon a quaint village , a hidden castle. All bedrooms have electric heaters. There is a separate living room with a 3 seater settee and 2 armchairs and a coffee table, TV and DVD player, selection of books. We have 450 m of river frontage so you can fish freely and privately on our grounds, from dawn to dusk. There is a fence to control unsupervised access to the river for added safety. There are 2 washing machines in the laundry room outside the villa. Towels are available for hire. You have your private terrace outside which leads to the huge garden with views of the cornfields. The stove has a grill and oven and the fridge has a small freezer. Extra freezers are available for your use in the adjacent barn. The 10m x4m swimming pool is fenced and alarmed for added safety. The pool is shared with the other villa. Smoking is not permitted inside the house but allowed outside(in the garden) There is a huge separate parking area. Onsite massage is available ,must be booked in advance. The house and property were absolutely lovely. Villa Hibiscus was so comfortable and we had everything we needed. Brenda and David were the best hosts and had great advice for all sorts of our questions. This place, just outside of Montignac and beside the Vezere River, was perfect. The accommodation was great catering for all our needs, the location was a peaceful spot right on the rivers edge with fishing available or just to wander. The facilities were good with table tennis and a swimming pool for the more energetic but still room to escape and just read a book. We were warmly welcomed and well looked after by our hosts David and Brenda who were always on hand but never intrusive and gave sound advice on where to visit and tips about events in the area. Would definitely recommend for groups like ours of 12 adults or indeed for family holidays where you can come together and yet still do your own thing. This was a beautiful and peaceful spot right on the river with great facilities. While some could be playing table tennis and others swimming, there was still room to escape and look out for kingfishers darting along the banks of the river. We were warmly welcomed and well looked after including sound advice on where to visit on our way home and tips about events in the area. Would definitely recommend for an extended family holiday where you can come together and yet still do yuur own thing. Rural France at its best. We had glorious weather which added to our enjoyment in Villa Hibiscus. We were a party of four adults and two children and so the house and amenities were perfect for us. Hibiscus was clean and very well equipped and as days were hot and evenings chilly the wood burning stove was much appreciated. The walk to the restaurant in Aubas was delightful. Brenda and David were very welcoming and helpful and we unreservedly recommend Le Four a Sel. Brenda and David are exceptional hosts who always made sure we were comfortable and had a great time. They have a superb property by the river with a swimming pool. We could do barbecues, strolls and even dance all night long- what a perfect weekend! It was very clean and spacious. I strongly recommend. We're a bit late writing this as we were there for a week in August 2014. 7 families holidaying together for the first time! We had a really lovely time & many thanks to Brenda & David who were able to recommend where to go & what to see but also as they really just let us get on with our own thing! We self catered including several BBQs as the setting at La Four a Sel is just beautiful. We may well return one day! 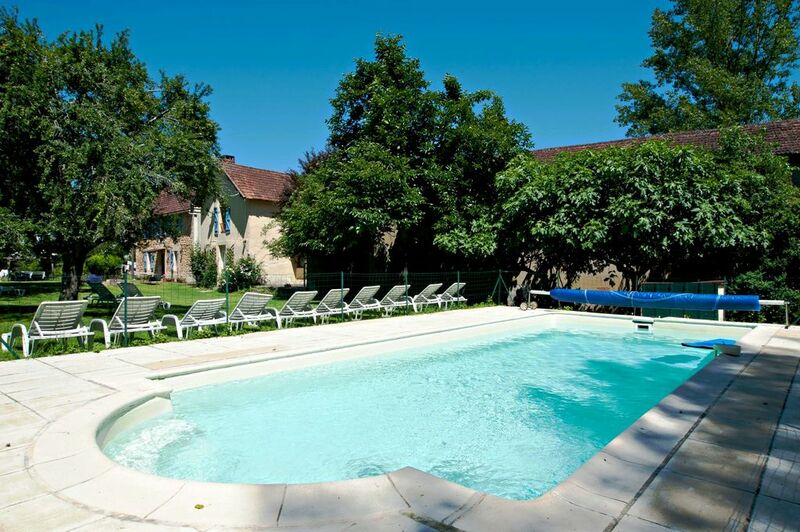 Le Four a Sel is in the village of Aubas, 2km from Montignac & the prehistoric Lascaux caves and 25 minutes from the medieval town of Sarlat & Les Eyzies. Popular Tourist sites like Chateau Hautefort, Domme, the feudal fortress of Commargue, the gardens of Marquessac, Roque Gageac ,a village carved on a hilltop, Roque St. Christophe , the medieval village of Castlenaud are within a 30 minute drive. Major towns close by are Perigeux and Brive and closest airports are Brive Souillac, a 40 minute drive,served from London City airport by Cityjet. Bergerac & Limoges are 1hr30 minutes away. Bordeaux airport is 1hr 45 minutes, and the vineyards of St. Emillion can be visited as a day trip. For walkers, cyclists or those who simply like to take a gentle drive along meandering country lanes, this is a magnificent corner of France. Must do : canoeing/kayaking down the vezere river or the Dordogne- the best way to see the sites. Other nearby activities:Horseriding - 20 minutes away; 2 lakes nearby within 20 minutes where you can go sailing, waterskiing, and one has a small beach; watersports with waterslides, a fishing lake , large playground, is 40 minutes away. Lots of things to see and do here-2 weeks won't be enough!! Golf: The Perigord Noir has some good golf courses with the added attractions of the region's wine and food to help you recover from the day's exertions plus a plethora of tourist sites and attractions to add variety to your holiday. Three 18 hole golf courses 40 minutes away .We can arrange tee off time. There is a CLEANING CHARGE payable as cash only ON ARRIVAL BEFORE KEYS ARE HANDED. (Rate varies dependent on the season and number of houses)There is also a SECURITY DEPOSIT of 1000 EUR payable 4 WEEKS BEFORE ARRIVAL. These additional fees are not displayed on the rental quote because the system will add this to the rental charge of the house, which will ultimately increase the service charge you pay to homeaway( the service fee is based on a percentage of the total rental quote).The security deposit will be refunded no later than 7 days after departure, if no loss or damage has occurred. Please also note that the deposit of 35% (Not 25%) is required to guarantee the reservation of 2 or 3 houses.This is non refundable. The homeaway system gives a drop down menu which limits the owner to a choice of 25% or 50% deposit hence this is what is showing but we are making you aware of this at the time of booking. The balance is required 16 weeks before arrivalfor bookings for July/August , the balance is payable on the 31st of January of the year of your date of arrival. By filling up the booking form, you agree to our terms and conditions. Special Rates for: Xmas,New Year, Easter, May Bank Holiday . Reduced rates offered during certain periods if less than 18 people (except July & August). In July& August, booking is from Saturday to Saturday. At other times, we are flexible. We accept short breaks or long week-ends , and various lengths of rental not necessarily for a week. . May bank holiday bookings-the balance is required on the 31Jan.Note: the service fee displayed with the quote is charged by homeaway(not us) when you pay online using their online payment service . You have the option pay us directly(via bank transfer or using your credit card via paypal) and can save on service fees.